Personas are the various people that will be using a specific feature of a capability. Personas help segment a capability's features by audience for reference. While gathering requirements, personas help to focus decisions around a capability's feature to limit potential gaps of missing requirements. In addition to helping focus decisions, they provide quick and inexpensive ways to test and prioritize features during the development process. 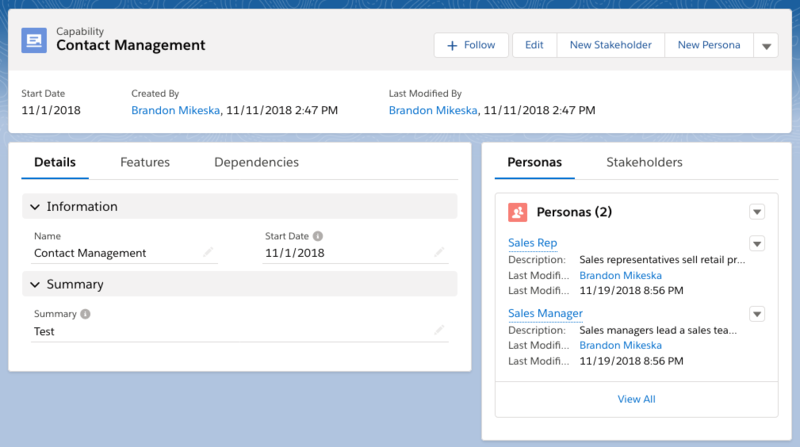 Overall, personas help visualize how a capability is used by each user group to provide a quick, yet powerful insight on if the capability is effectively been developed. When developing features for a capability, it's best to think about all of the user groups who will be included. It's best to start thinking about Personas before developing features because personas can inform functionality, help uncover gaps, or highlight new opportunities. You may develop one or more personas for a given capability. A good gauge on if a capability encompasses too much or not is by looking at the number of personas. We recommend creating only three or four personas for a given capability. Who are the various people that will be using a specific application? That's what a persona is and by adding them to your project, you will be able to develop with specific users in mind. To create a persona, use the "New Persona" at the top right of your project. The "New Persona" dialog box will appear for you to add your desired persona.